Does God want believers in Jesus to be rich and happy? The teachings of the prosperity Gospel theory would lead us to believe so. Similar to most false doctrines there is a blending of the truth and the no so true. The prosperity Gospel is considered a false doctrine by many because by its name (prosperity) it is often thought of as being wealth related. For some, the prosperity goes beyond financial wealth to include such issues as, happiness, health and social status. Should there be Christian Millionaires and Billionaires? Should Christians have things like fancy houses and collector cars, extra jewelry and vacation homes, expensive clothing or hired staff, setting themselves apart from those who for various reasons haven't obtained them? Clearly, God wants all His children to be happy. He wants believers to "Rejoice in the Lord." As long as reflection upon what God has done in your life, is currently doing in your life, will do in your life, along with that line of thinking concerning family and friends is the source of your rejoicing, then great...you get it..continue on...in fact you are commanded to rejoice and give thanks. God doesn't mind some people being better off than others financially. After all, He is the source of all true blessings. Sometimes there is a biblical principal behind the wealth. Often, when God gives someone a little, and they use or invest the money wisely, they are given more. Remember, everything we have is just kind of on loan from God. (Read Matthew 25 parable of the talents) We have an obligation to be good stewards of what He has lent us. As long as things were done by and through His guidelines and timing to establish that financial position, then enjoy that...the proper way. Should Christians Be Millionaires And Billionaires? One reason some believers are well off financially is to be in a position to help others. Giving with a cheerful heart benefits both the giver and receiver. God did not demand that the early church body give up everything it had to help those who didn't. Some gave more than others and so it is even today. If you are well off, consider helping someone who isn't. Widows and children with no parents are a great place to start. Helping to feed the hungry or a donation to a faith based not for profit are other good choices. Of course, it is always good to give back to where you are being spiritually fed from first, like your church. One issue comes into the picture when we...as humans...want to link our material items to success and being happy. We are to rejoice in the Lord, not in what we have (that should be a thankful response). The more prosperous we are, the more tempting that link can become. So ask yourself, are you rejoicing over investment returns because you have more or because you have more to give back? Another prosperity Gospel issue occurs when we go beyond having what we need and a few comforts of home. Let me ask you... just how well off do you think God wants you to be? How well off would a person need to be before they reached what they thought was the upper limit of Gods blessing financially... if there even was a limit? Where is the line between having extra but going about it the right way and having too much? Is it possible for a Christian to have too much? When is the last time you asked yourself...how much money do I need to retire? Unfortunately, society teaches us to be thinking about that through most of our working life. And that answer, which is usually just an educated guess, is different for each individual because only the Lord knows how long we will live. Would your spiritual walk be better if you saw God provide for your needs on a daily, weekly or monthly basis or if you had 1 million dollars in the bank, would you wonder if you could live off "the interest" instead? Often we can learn from Israel. Which idea would be similar to the original concept behind Israel wondering in the dessert for 40 years. Their provision "manna" came daily (except for the double potion to allow for the Sabbath). The idea that we need to look to God and not our stockpiled resources for provision has biblical roots. If you have so much that you and your family will never have to work again and at the same time your focus is on paying less taxes and better investments but not helping others then you are chasing the prosperity gospel and not the true gospel. If your prosperity happiness comes from your third home, the latest greatest big screen TV, the new piece of jewelry you just got, the latest model of the car you drive, the other cars you have just because you can...vacations all around the world and a staff of several hired people to help you live this lifestyle then you may be looking to the wrong source for your happiness. In todays times (and early church times as well) there are thousands of believers who are not well off financially that could use a little help. If God has blessed you financially then perhaps He wants you to be comfortable, but not so comfortable that you fall asleep and forget the obligation to help others. God wants everyone to enjoy the blessings of a sunrise and sunset and the stars in the sky. They are free. His creation cries out with His glory. He also wants everyone to be blessed through His Son Jesus Christ...again free. Knowing Him is the greatest prosperity Gospel there can ever be. It is the bit of prosperity that you CAN take with you when you die. 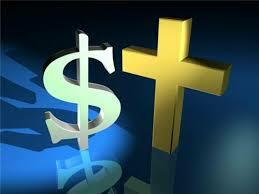 Image of cross and dollar sign from Google images.